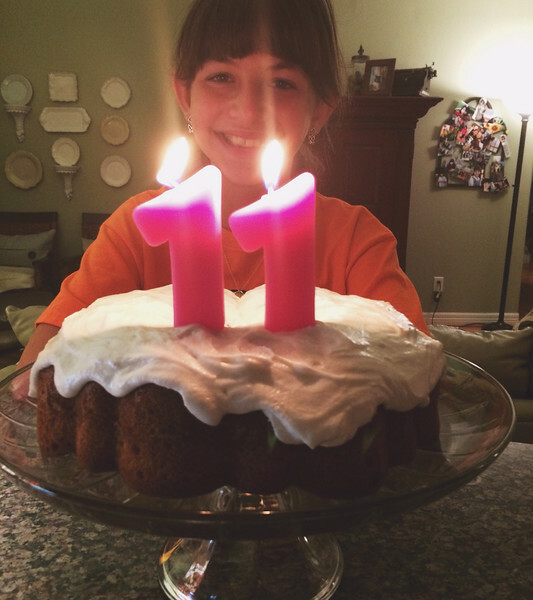 We celebrated Annelise's 11th birthday last Thursday, pretty much all day. 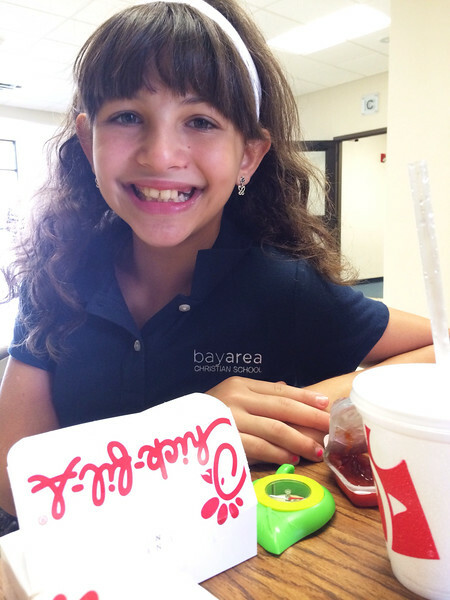 Before school she got to open a present, a new pair of earrings. They're little dangly butterflies, which she loves, but something about wearing slightly larger earrings than she usually did (she always wears the same silver heart studs) made her look so much older. But what can you do? Time keeps on ticking and birthdays keep on coming. She also got to wear her new red Chucks, which she was thrilled to do after having to wait since the Friday before when we bought them (I am so mean, I know). A few hours later I brought lunch to the birthday girl. Yum! 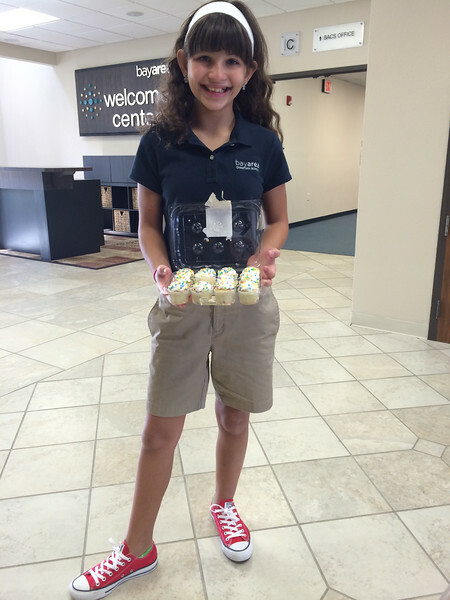 Then she passed out mini cupcakes to fifth grade (the rest aren't pictured). Normally we'd just share with her class but since she has friends in other classes and all of fifth grade eats together we decided to go big or go home. After school she had dance, which she wanted to skip because it was her birthday (??? ), but I wouldn't let her (I know, I'm so mean). After that we went to one of our favorite Tex-Mex places (really, are you surprised?) (but really it was her pick) for fajitas. Pappo and grandma gave her a hot pink plush blanket, which is her love language, and a fishing pole, because, every girl needs one of those. Aunt Jerry sent her a lovely sentimental gift, an old-fashioned fountain pen that uses ink in a jar (???) that her grandmother had given her when she turned 11 and that her grandmother had gotten herself in 1897. That's so cool! We need to get some ink so she can try writing with it. 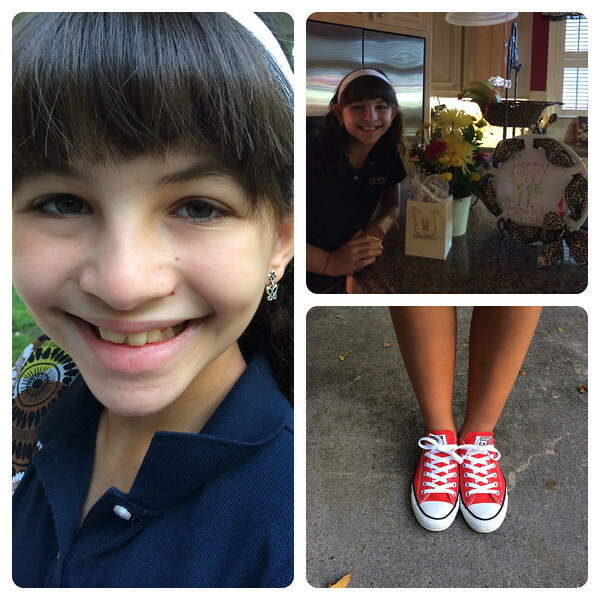 We gave her a James Avery charm bracelet with two charms, the letter "A" and a soccer ball to get her started. She loves it! We also gave her something in her other love language, clothes, a maxi skirt and tanks to mix and match. Every year she gets to pick her birthday cake and this year she surprised me by asking for a lemon bundt cake. Y'all can just go ahead and slap me because I didn't take any photos of the present opening or the cake enjoying or any family shots, that makes me sad but at least I snapped a few throughout the day with my phone (my DSLR is crying). It had been a few years (okay, maybe more than a few, hush) since she had birthday party with friends and last year we went to the Big Apple on her birthday (can we go again, puh-leazze? ), so this year is going to be a party year. Just a few weeks later than her actual birthday. Whatever. She's having a sleepover birthday party, nothing huge and crazy, because Mama don't play that way, but she's inviting four friends from school (for a potential total of five girls, that's manageable, right?). Yesterday I made the invitations, just a simple washi tape bunting, because washi tape makes me happy (the party info is on printed on the inside). They went in the mail yesterday too, so I guess there's no turning back now. It'll be our first time hosting a sleepover. Very cute invite! And delicious looking cake! 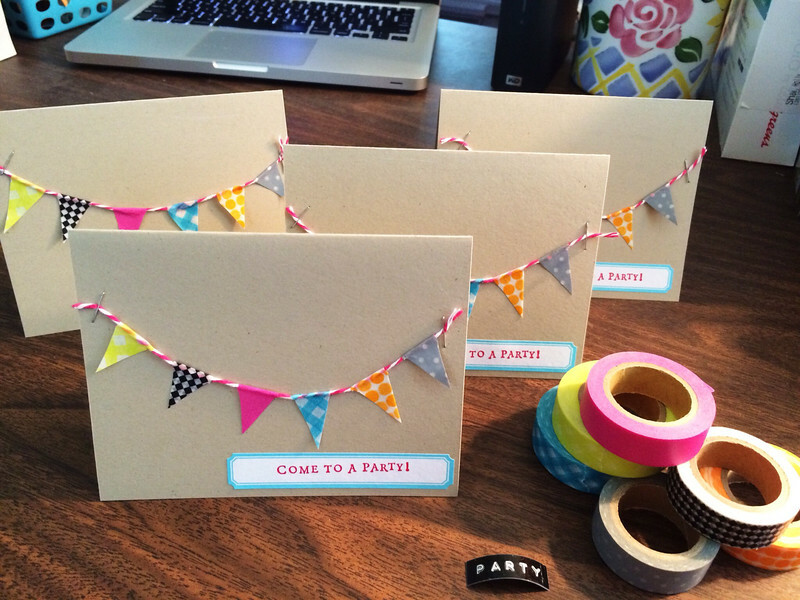 It was my first time to make little washi tape bunting--now I'm hooked because I think they're so cute.